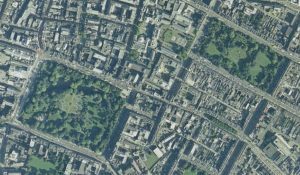 Its present form began in 1664 when leases were drawn up by the civic assembly for ninety-six plots each with a frontage of 60 feet to surround a central green of 27 acres. 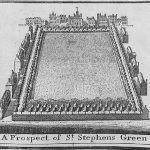 There certainly were buildings on the plots at this time – as recorded by Brooking in 1728, the present Georgian buildings around the Green all date to after Mrs Delany’s account. 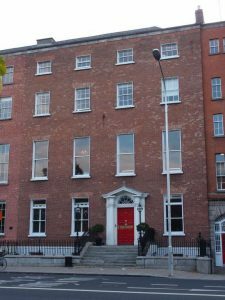 Some of the earliest houses on the NE and SW corners have narrower frontages than the majority indicating that the generous initial plot widths were sometimes subdivided. By way of contrast, there are the wide and tall cliff-like brick houses built later in the century by Gustavus Hume. 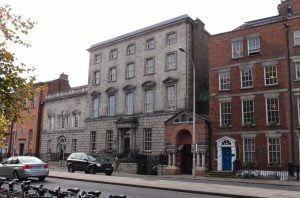 There are also ashlar clad early and mid eighteenth-century palazzos on the south side of the Green. Late Georgian is represented by the College of Surgeons, and one Victorian hotel survives on the north-east corner. 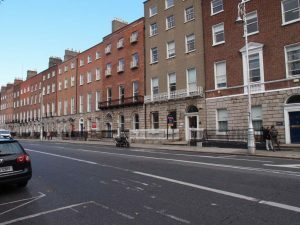 Twentieth-century interventions – office blocks and shopping centres – doesn’t detract from the fact that there are buildings of sufficient quality for St Stephen’s Green to rank it among the finest Georgian squares in Dublin. The green area was closed to the public for part of the nineteenth century. Landscaped by Lord Ardilaun from 1877, it was vested by him through an Act of Parliament, back into public hands. Long terraces of eighteenth and early nineteenth century brick Georgian houses surround a green area on three sides. On the west side the garden front of Leinster House forms a centrepiece, flanked by Italianate nineteenth century buildings of the Natural History Museum and the National Gallery. The seeming uniformity belies a more protracted building sequence (c.1750 – c.1818) with subtle variations within this former residential suburb, instigated by the Fitzwilliams, in close proximity to the early Georgian city. 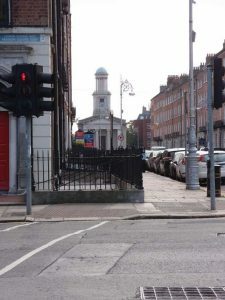 The view east from the south side of the square ending in the eyecatcher of St Stephen’s Church gives a sense of streetscape as theatre and unequalled in Dublin.